Tired of belly bulge? Well here is a super easy to make recipe (only 4 ingredients) that will help shrink your spare tire and make you more gorgeous! Super excited to share this recipe with you all :)!! Hope you enjoy! Avocados are a belly busting food that I can’t live without! They contain lots of AMAZINGGGG fiber (11 to 17 grams per avocado) which keeps you FULL for hours!! They are also a terrific source of potassium and vitamins C (burns fat), K, folate, and B6. Half an avocado has 160 calories, 15 grams of good heart-healthy fat (monounsaturated fats), and only 2 grams of saturated fat. Place all of the ingredients into food processor or blender. Blend until smooth. 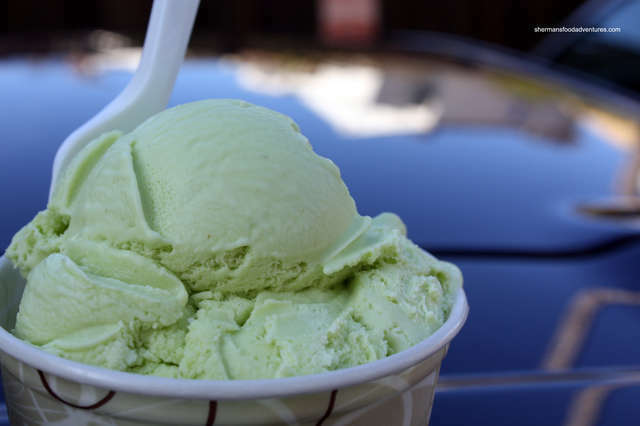 Wow…avacado icecream. I would have never thought about it but it looks great. I will for sure add this to my belly burning list for my readers. Thanks for sharing!